For those of our guests who have extended stays here at SECU Family House, many of them establish a daily rhythm of sorts, oftentimes a rhythm that ends up mirroring their own daily home routines. Such was the case with recent guest, Sonya Campbell. Hailing from Lexington, North Carolina, Sonya was a patient in the Partial Hospitalization Program for Eating Disorders at UNC Hospitals - a program within the Center of Excellence for Eating Disorders and a world leader in the treatment, research and training of eating disorders. 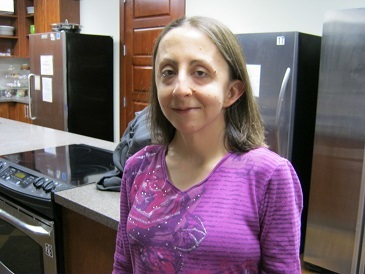 During Sonya's stay, she was one of our early risers, coming into the kitchen before 6 a.m. to make the first pots of coffee and emptying out the dishwashers before taking the bus to UNC Hospitals for a full day of programing and treatment. Diagnosed at birth with Turner Syndrome, a chromosomal disorder, she was not expected to live beyond five years of age. Yet, this diminutive, thoughtful and articulate 33 year old former CNA persevered, undergoing additional treatments for early onset osteoporosis, abdominal aortic aneurysms, and blood clots. In 2012, she became concerned with her weight and was eventually diagnosed with an eating disorder. Sharing that one of her core values is to be of service to others, Sonya continued that belief while she was a guest here, doing what she could in the kitchen each morning and late at night after her treatments. "I remind myself that if I'm hurting, there is someone out there who has it so much worse. I will do what I'm capable of. I live with gratitude each day." Sonya says that she's able to focus on recovering from her eating disorder and other health issues in a "warm, loving, safe environment while being 100 miles away from home. I owe so much to the generosity and grace I have been shown here and will be eternally grateful that a place such as SECU Family House exists. It makes all the difference to a person's recovery to be made to feel at home when they are so far away from their own. It's so selfless what you guys do here." Making fresh pots of coffee. Emptying dishwashers. Cleaning the sinks and countertops. Having conversations with strangers who quickly become friends. These routines add to the vitality of each and every one of our guests and their loved ones.